Look at the Photo Gallery !!! Now that MicroRad 2008 is put in archive, we want to thank all the people who helped us in making a great meeting, with their kind attendance, presentation of interesting papers and posters, participation in MicroRad events and accomplishment of various tasks. Following the initial meeting in 1983, MicroRad has progressively grown to this day. At this meeting, as a matter of fact, we have received more than 200 excellent papers, on which we operated a strong selection. Nonetheless the agenda of this meeting was very intense and the final program included 80 oral papers distributed over 8 sessions and as many posters divided in two sessions, for a total of 138 participants that came from more than 20 countries all over the world. The meeting was opened by a very interesting presentation of Prof. Rodolfo Guzzi of the Italian Space Agency on the COSMO-SkyMed program. 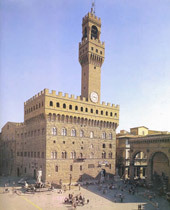 In addition to the technical program, we have endeavoured to create a social program, which started with a reception on Tuesday 11, at Orsanmichele, which is one of the most important monuments in Florence, in a space usually closed to the general public. So we hope you enjoyed being the only ones allowed in! On Wednesday 12, Gian Paolo Muntoni enlivened a casual Buffet Dinner with a Piano recital at Teatro del Sale.On Thursday 13 the Award Social Dinner took place at Grand Hotel. During this event 3 Golden Florins were given: one in memory of Giovanni d’Auria, who was the promoter of the meeting back in 1983, and two to Tom Schmugge and Anatoly Shutko for their invaluable work on soil moisture. Moreover, the 1.000 € prize of Fondazione Ugo Bordoni, entitled to Giovanni d’Auria, was assigned to Corinne Straub, of Berne University, and Domenico Cimini, of the University of L’Aquila, for their relevant presentations on atmospheric topics. Last but not least, on Friday afternoon a Wine & Cheese closed the meeting as a farewell and six best posters were awarded with “luxurious” prizes (a bottle of Brunello wine!). The Proceedings of the conference will be published in the IEEE Xplore and in a CD-Rom that will be sent to the conference participants. A TGRS Special Issue with a selection of the papers presented at MicroRad 2008 will be published in 2009. Further information on the Call for Papers can be found on the web page.